Jean R. Slutsky is the Chief Engagement and Dissemination Officer at the Patient-Centered Outcomes Research Institute (PCORI). She leads PCORI’s Engagement Program and growing dissemination and implementation planning efforts. She also serves as Director of PCORI’s Communication and Dissemination Research Program. 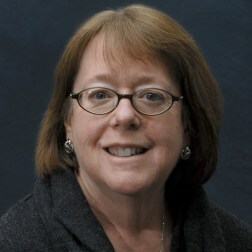 Before joining PCORI, Slutsky directed the Center for Outcomes and Evidence at the Agency for Healthcare Research and Quality, where she conceived and implemented the Effective Health Care program. The Effective Health Care program is an integrated program of research, stakeholder engagement, research training, and dissemination and implementation of comparative effectiveness research. Slutsky is particularly interested in pragmatic user-driven research and its implementation into healthcare decision making. Slutsky received her baccalaureate degree from the University of Iowa, trained as a Physician Assistant at the University of Southern California, and received a MSPH in health policy from the University of North Carolina at Chapel Hill.